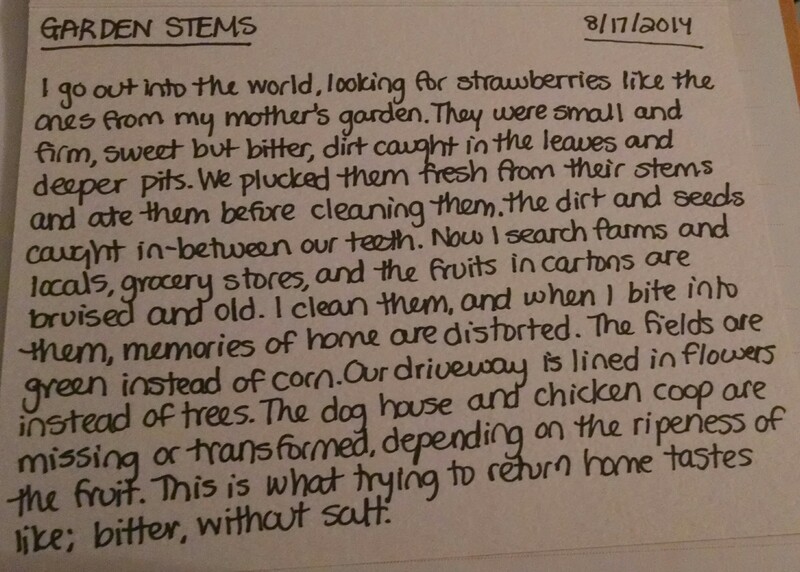 I go out into the world, looking for strawberries like the ones from my mother’s garden. They were small and firm, sweet but bitter, dirt caught in the leaves and deeper pits. 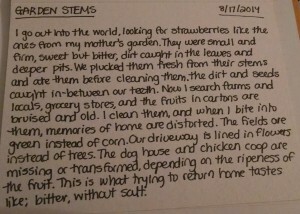 We plucked them fresh from their stems and ate them before cleaning them, the dirt and seeds caught in-between our teeth. Now I search farms and locals, grocery stores, and the fruits in cartons are bruised and old. I clean them, and when I bite into them, memories of home are distorted. The fields are green instead of corn. Our driveway is lined in flowers instead of trees. The dog house and chicken coop are missing or transformed, depending on the ripeness of the fruit. This is what trying to return home tastes like; bitter, without salt.